Dan Harris, current co-anchor of ABC News’ “Nightline” and co-anchor of the weekend edition of “Good Morning America,” has worked with ABC News since 2000 and has become a regular fixture on the channel’s various news programs. Following a long stint covering war in Baghdad in 2003, he returned stateside suffering symptoms he did not realize were effects of Post-Traumatic Stress Disorder. Uncertain as to the cause of his symptoms and unwilling to seek professional help, he turned to recreational drugs including cocaine and Ecstasy. Following an on-air panic attack induced by stress in a competitive industry (something that the infrequent but frequent enough drug use didn’t help), Harris sought advice from a mental health professional. From there, Harris was given a new work assignment covering faith and spirituality for ABC. As a lifelong skeptic, Harris was thrown headfirst into a world of mega churches, evangelical movements, mosques, and Mormons. His religious education soon included the works of Eckhart Tolle, a popular self-help guru whom Harris immediately dismissed. However Tolle’s introduction to Zen unfolded into Dr. Mark Epstein’s bridge between psychology and Buddhism. It was the psychology and reason behind meditative practice that brought some solace to Harris and encouraged him to continue his research (not without pithy commentary) into Buddhism that has ultimately shaped his recent life. “Mindfulness” would be the key term in his writing, this being a relaxed attitude recognizing and accepting your thoughts without judgment. That is to accept your thoughts without determining whether or not it is “right” or “wrong” to think them. In his writing, Harris is openly skeptical and appears to be a reluctant seller on the whole idea of mindfulness and meditation. He gives a realistic description of the aggravation coming from sitting alone trying not the think about specific things but really only thinking about specific things. 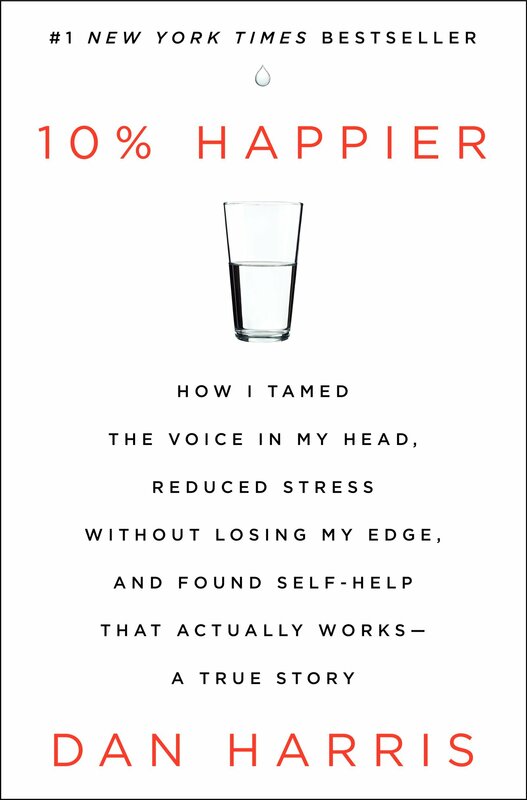 His aggravation, doubt, and weary optimism help to make a 10% Happier and Harris relatable for others facing a similar doubtful and skeptical approach to meditation and practicing self-acceptance.